OAR collected new, donated toys that will be given to children of incarcerated parents through our Project Christmas Angel program. The toys were collected in October and November. Donation boxes were placed throughout the community at various nonprofit, government, business, civic, and faith organizations. Still interested in donating? 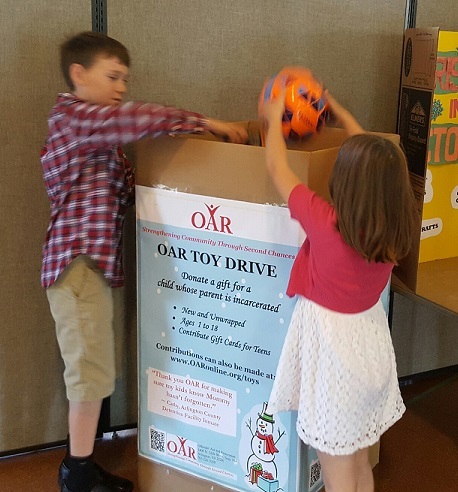 You can donate items directly to OAR by dropping off your donation at the OAR office during business hours prior to December 16, or by purchasing items from our Project Christmas Angel Amazon wishlist and having the items shipped to the OAR office. Please make sure to tell us who you are so we know who to thank! Gifts for teens are especially needed, and gift cards are welcomed, as well.